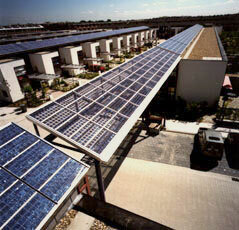 Summary The PV project consist of 38 owner-occupied row houses with 20 m2 of panels each and 2 solar gates with 47 m2. The total is 865 m2 PV panels , ca. 88 kWp. The PV-systems are owned by the local utility REMU (now: Eneco). The house owners get 20% of the solar elecricity for a lower tariff. Investor for the houses was: Van Zwol BV Ontwikkelingsmij., Amersfoort-NL. The yearly solar electricity output from the 38 attached houses with PV in the 'Pantha Rhei' sub-project is expected to be 65000 kWh.